Parnell Station will open, served initially by Southern Line trains with Western Line trains only stopping in evenings and weekends. Onehunga line trains will skip Greenlane, Remuera and Parnell stations. This is said to be to speed up services enough that it frees up a 3-car train. Speeds on the other lines will also be improved, enough that it frees up an additional two 3-car trains. In total the changes free up three 3-car trains, which will be used to boost capacity on some peak services. The big unknown was just how much faster the trains would be. AT have now published the new timetables along with some information about them. In terms of the information surrounding the changes, overall I think AT have done a decent job and for anyone who bothers to read it – which let’s be honest, most won’t bother to do so. They’ve bullet pointed the key changes for each line nicely and it feels like they’ve been more open than they have in the past about why some of the changes are being made. One example being the Onehunga Line changing to limited stops which they say is to “improve travel times and the number of units required to operate the Onehunga Line“. In the past it has felt like changes have often been made with little explanation. It’s great that AT have finally included the Northern Busway as this is something we’ve wanted to see for years, but …. With the inclusion of the Busway, perhaps it’s time to drop the Train Network terminology and refer to it as a singular Rapid Transit network. Perhaps we could just call it ART – Auckland Rapid Transit (yes this was also the official name of Robbies Rail in the 1960’s and 70’s). What’s with showing the connection between train and bus as a massive walk. While I appreciate that there is a walk between Britomart and Lower Albert St and that this is a schematic, not a geographically accurate map, the walk between the two looks substantial, about the same as between Newmarket and Britomart. It is not particularly arduous and showing it this way feels like it has the potential to put some people off trying this as an option. Suggesting you have to walk through the Ferry Terminal is also incorrect. All of this isn’t to say that the connection between the two services couldn’t be improved but that’s a discussion for another post. I’m also in two minds about showing the Western Line as doubling back on itself. While it’s technically accurate and may help avoid confusion from new users, I’m not sure it’s entirely necessary on a schematic map, especially as it appears to be one of the reasons the Busway can’t be closer. AT have dropped the aircraft symbol from Mt Eden but retained it at Papatoetoe. I wonder if this is anything to do with the Skybus service being fully commercial. AT have added in hospital symbols for Auckland and Middlemore but why not North Shore Hospital, which is a similar distance walk from Smales Farm station as Auckland Hospital is from Grafton. It’s interesting that they’ve includes information about toilets as it highlights how few of our stations have even basic amenities. As a comparison, this is what it currently looks like. Southern Line – Services are 3-minutes faster to Britomart and 1-minute faster to Papakura. AT also say they’ve reduced the transfer time at Papakura to/from the Pukekohe shuttle. Eastern Line – No changes in time despite no longer stopping at Westfield. Onehunga Line – 5 minutes faster to Britomart – although even in the evenings when it stops at Remuera and Greenlane, it is still 4 minutes faster than today. While time improvements are definitely welcome, these ones are nowhere near enough the level they need and as we’ve highlighted before, the likely best opportunity to achieve them is to improve dwell times. Also disappointing is that there has been no improvement to inter-peak frequencies. This was particularly needed for the Southern Line where the new bus network has already rolled out and for which the rail network was meant to be the all-day frequent backbone. Did the rail team not read the strategies that have been publicly discussed and consulted on for many years now? Those inter peAK frequencies really need to be addressed along with weekend frequencies. In short they cant lift the Eastern and Southern Line frequencies in the weekends due to the amount of freight trains using the Line at the time. I would have thought 20 minute frequencies would be possible with freight train movements, as this is what we have on weekdays off-peak. 20mins is doable, 15mins as in the Regional Public Transport Plan was not until that $144m Third Main (Otahuhu to Papakura) was built. Agree, but 20 minute weekend frequencies would be a significant improvement. Same with me, I drive to work in the weekends as the trains are not there. So the Congestion Free Network would be ART Nouveau? I am kinda curious, what is the level of interpeak usage of trains in Australia and Wellington? I agree it does need to be better but what is the best we can hope for? Is there other ways of boosting off peak usage? Could we have major events near train links? Would moving events like pasifika to Hayman park help much? Is there a demographic like students we should be targeting with discounts? Or would it be more effective to provide an off peak discount rate for everyone? I am a little confused why it is 4 minutes faster to go to Britomart from papakura but only 1 minute the other way? On the southern line congestion has been relieved north bound but is still an issue south bound, there is your three minute difference. Wellington is very tidal in terms of peak flows, so it’s probably not a great comparison. Despite having significantly lower passenger volumes, they have more passengers arriving at Wellington during peak than we do at Britomart, so I suspect Auckland already has more off-peak use and also against the tide use during peak. Also Wellington has 30 minute off-peak frequencies so worse than Auckland does on weekdays already. Wellington report peak and off peak ridership annually. Overall they say 50% of trips are in peak although that varies by mode. Buses have just 43% in peak while trains have 64% in peak. Rumour is improved interpeak frequencies are coming to wellington in June or july, weekdays only. I use Metlink a bit…They have been really good service wise here and the reliablity appears to have improved a bit as well. Including the frequency would I reckon should be 25 minutes for the Hutt and Kapiti Line and 30 or even 45 minutes on the Melling Line…Not sure about Johnsonville since they are restricted by passing loops but I’m certain they can handle a 20 minute frequency as well. I know the Waiarapa train is still having big problems with being on time so they now made Maymorn and Matarawa a requested stop only…Which I don’t think is good at all…But I don’t know of any other ideas on improving the service other than putting higher speed limits on the tracks in the Waiarapa. I think Johnsonville is 15 mins at peak so it must have sufficient passing loops to achieve this off peak as well, although they might be in the wrong spot for trains to pass on a 20 min frequency. Wairarapa timetable is restricted by the abily to cross two services efficiently north of trentham (remaining crossing loops have only one platform). One question, I wonder how much harder it would have been to have the Onehunga line stop at Parnell evenings and weekends? Then the pattern would be consistent, all lines stop there evenings and weekends but only the southern stops at peak times. Good idea Nick, especially given how poor the weekend and evening frequencies are, and how that would improve legibility and simplify communications. I guess the issue is whether it is enough extra time to require a third train to operate the Onehunga line. Wouldn’t want to increase opex 50% for one stop. These are good steps forward by AT. Especially good to see our nascent Rapid Transit system being communicated as one in its mixed-mode glory. Shame the Devonport Ferry isn’t really frequent enough to warrant inclusion to really underline that. However I do think the new map is a good illustration of the legibility costs of system complexity. All those little notes on exceptions. The little green walking man is redundant, the dotted line is sufficient, and without that him the Ferry Terminal could be shown directly above Britomart and the Albert St Bus Station closer as Matt says. Overall it seems legibility has been sacrificed a little for accuracy, and probably a little too much for current map design thinking. For example you normally don’t expect a schematic like this to include detail such as which track each service uses yet seems to be the thinking behind the placement of the Newmarket lines…? There is always a tension between accuracy and completeness of information and legibility in these maps, and this map does go for a lot of detail, look forward to seeing how it works in the wild. Happily this is a map that we will see evolve and enlarge over the years ahead so there will be plenty of opportunities to tweak the details. Also very pleased about the speed improvements, look forward to that work continuing. I would’ve liked to see the map laid out so that the CRL could also be added. The main reason is that it would make communications with the public clearer when discussing the difference between the current and future maps. I think that Matt has raised some good points, though I can’t agree with the criticism of the pedestrian link. As Patrick has pointed out, completeness of information and legibility do sometimes represent competing priorities and this is just an example of the map catering for the lowest common denominator. From my perspective, if one was confused, there could be ambiguity with simply a dotted line and a solid line would indicate a same mode link. Whilst adding the ped symbol does add clutter (hence the increasing of distance between points to de-clutter the map), the improved clarity is important. March madness is well and truly in play, judging by my commute this morning. I don’t think the actual time a service takes is as important as the frequency – in other words, the ability to just walk to your local bus or train stop and know there will be a service within the next five or 10 minutes. Good to see an express service alongside the Southern Motorway between Ellerslie and Greenlane, just to show those stuck in traffic just where they should be commuting. Problem is, the train services between the CBD and the outer suburbs are tidal, inwards in the morning and outwards at night whereas the Southern Motorway is a mobile parking lot in both directions, especially in the afternoons and evenings. Frequency is vital, turn-up-and-go is transformational, but remember one key to improving frequency on a capacity limited system is speeding overall journey time; more services are then possible with the same overhead in the same period. AT have reduced the directional switch time at Newmarket for Western Line services from 4 minutes currently to 2 minutes, weekday outbound; and from 4 minutes to 3 minutes, weekday inbound. Especially for the outbound time reduction, do you think they will have a replacement driver at the opposite end to achieve this time reduction, or is the driver meant to walk (run) especially quickly to the opposite end? There is driver changing at Newmarket to achieve the time saving. Often the driver at Newmarket (as elsewhere) is waiting for the TM to close the doors to get going. Will this change? Outside of peak Newmarket is a timed station (can’t depart before the timetable time), the TM is either waiting for the time or on occasion transferring passengers. Starting in April when the southern train start opening the doors on both sides, requiring extra time to close them. The southern wont open on both sides ted, the will simply open on the other side inbound. Lets just see what happens in April then Nick. I agree that the journey times, especially for commuters from the outer suburbs, need to be improved but having an overly complicated schedule where some trains stop at some stations but not at others and the timetable changing in the weekend does not make for a very customer friendly, easy to use service which is vital if more people are to be encouraged to use the trains during off-peak times. Also, most commentators on this blog agree that the main reason for the trains spending too much time at each station is the need for the ramps to be lowered and raised. Are these ramps really necessary or an extravagant luxury? In Wellington the trains have no ramps and on the very few station platforms situated on a curve (on the Johnsonville route) a message is broadcast over the PA system as the train arrives at the station warning passengers to mind the gap. Wellington commuter trains are also able to travel at top speed on more of there network – the Porirua-Paramata straight and the Paekak-Paraparaumu-Waikanae straights. Disclaimer: I live in Wellington, but have also travelled on the Auckland trains. Just to clarify the ramps are only on the low floor carriages and are there for wheelchairs, mobility scooters and push-chairs. They are more of a step that extends to the platform than a ramp, there is no lowering or any angles involved. They are one of a number of components that add up to long dwell times, I think debate on this site in the last couple of years would show there is no agreement at all as to what the biggest/easiest to solve delay is! How many accessible stations does Auckland have anyway? Can’t we all agree that AT should just copy another city that has more experience with commuter trains than us? Maybe London for example? I thought they all were except for Westfield, and by the sound of it Parnell, but I imagine that would depend on how accessible is defined. Mobility access is important on PT, although the current ramp arrangement clearly needs work, it shouldn’t be at the expense of mobility access. Agree, the list of cities we could go to for ideas is unlimited. Multiply out the time wasted at each stop by having the disabled-optimised access, and you might find it’s cheaper to give all affected users Uber credits. Why not compare to a city in a developing country like Chile and then ask, “how could we have got this so wrong”. Freight train curfews are irrelevant to any discussion regarding platforms. Australian cities may well have freight train curfews but they still have to design the platforms for freight trains running outside of these curfews. As far as I know there is little freight movement on the Auckland network during peak anyway as passenger trains have priority and there is little room for freight trains between Wiri and Westfield due to the 5 min frequencies on that section. jezza there are at least three northbound and a couple of southbound freights during the morning peak south of Wiri, at about the same frequency as the rest of the day. Why can the ramps not be lowered at the press of a button when needed? I’ve seen this on multiple transit systems around the world including heavy train, LRT, and buses. I (and I have seen others) have helped people with prams when they don’t want the time and bother of waiting for the ramp to deploy. I’m sure that is completely possible, as I mention above there isn’t any lowering, it’s just a horizontal ramp. Just requires AT to make it a priority. Like you when pushing my pushchair I wouldn’t bother deploying the ramp but others may wish to. …which raises the question why the ramps are fully retracted, when the fixed steps don’t. Has there been a post regarding January 2017 Patronage yet? I am impressed that they are actually trying this year. In the past services were fixed and nobody in charge cared if they were overloaded. Is there any update regarding gating of some of the stations, in particular the Parnell and Otahuhu Station? Parnell gates “will be installed from from mid-2017”. Looks like will be a pretty basic station on opening alright. Visited on Sunday. See my Twitter (click on my name above) for pic taken on Sunday. For the Western Line, why is it still only 30mins off peak and weekends? This needs to change as more people use this line then any other. The southern line has 15min off peak at weekends why not the Western? also when are they going to get real about dwell times and the horrible way they go through level crossings, like there is a bomb about to go off. Solve these things, which are rather simple, and the train times decrease rapidily. The Western, southern (and eastern) lines all have the same peak, interpeak and off peak frequencies. Well, except for the fact that 2/3rds southern line stations have two lines on them so get double frequency. oh ya Eastern sharing with Southern too forgot momentarily. You get a bit more (than Eastern or Western) from Remuera to Penrose with the Onehunga sharing the “line” with Southern of course, but not so much with the new skipping about to happen. Southern needs the off peak the most with their new network, but agreed need on all lines. How well do the Western road crossing do when its peak time out of interest? yeah agree, title of the network should simply be “Auckland Rapid Transit”. But generally these all sound like decent albet not startling improvements. Look forward to this trend continuing as/when dwell-times, rolling stock, and/or budgets allow. – AT are persisting with low off-peak frequencies on Western Line. I guess it’s a budget problem I guess? – Trains in the south are still not up to frequent status. How many years ago was the initial RPTP released that committed to a network of frequent bus and rail services? I think it was almost four years ago if my memory serves me correctly (which it often doesn’t). I must say I did enjoy catching a Double Decker on the 973 this morning from Birkenhead to the City! re the “Schematic Train Network” – I actually like the Newmarket line doubling back, I would be confused as a new user coming from West for the first time as to why I’m turning a big right, stopping and changing directions (and would think I have got on the wrong train and likely to jump off at Newmarket). If you don’t like walking 150m to make a connection i would strongly discourage going to London or Sydney. There have been many posts on this blog concerning those stored SA and SD cars. Unfortunately there are some naysayers here who think these are worn out old ex-BR carriages not worth bothering with- despite the fact they were completely rebuilt and when put in storage in 2015, and had a futhjer 30+ year life. Where do you get the locos from, how much do they cost, what is the maintenance plan contract for them, what is your stabling plan, how do you justify to rail regulators return of passenger services not ETCS L1 compliant do you have a HSEQ proposal plan, how do these extra trains fit into Newmarket junction, what is your media plan for when residents groups complain betrayal with the return of regular the diesel trains, how do you deal with them when they complain to Orsman that their property valves have fallen as a result, which drivers you going to hire, will we need to train new ones, or replace EMU drivers trained on old locos, where is the budget for the extra OPEX what is the opportunity cost of that OPEX, will KR let you run these extra sets between West-Wiri without third main? The locomotives come from the laid up DCs, there are plenty, very serviceable, available and there may even be surplus DFs since these were being displaced by later tranches of DLs. ETCS lvl 1 is not rocket science and fitting the appropriate computers and sensor readers to the SDs and the diesel locos is definitely feasible, capex yes but not excessive. There is no evidence there would be a citizen revolt if diesels returned, anyway isn’t the general views of bloggers and posters here that Nimbyism is a resident evil? So the evil Nimbys can block affordable housing but the anti-diesel train Nimbys can dictate RT train operational matters? KR and the 3rd main, aren’t they building it now? Drivers for diesels? Nobody has ever stated they are not available. Pahway through Newmarket? Sort out the western service reversing and there would be a least one additional pathway? Doesn’t explain how you have a) budget for opex for staff, rental, maintenance, stabling & b) If KR would be willing to do so. No third main isn’t being built, only a draft business case part of it was finished when KR had some money a few years back but still 5km to go. Sure I don’t like NIMBY’s that doesn’t negate the fact that they exist and you would need a media plan to deal with it. Staff would be a problem, due to lack of training funding by AT over the last year the current timetable requires in excess of 125 drivers shifts per week to be covered by overtime or other normally non driving staff meaning that what they normally do is not being done (like drivers assessments etc). I don’t get it. Why would AT fund training for drivers? They don’t fund training for bus drivers, or ferry drivers, or transpower staff, or any of their other contractors staff? Surely staff is the main part of the contract. Think Ted needs to put in full stops, commas or re-word that sentence, I can re-read that in so many different ways. 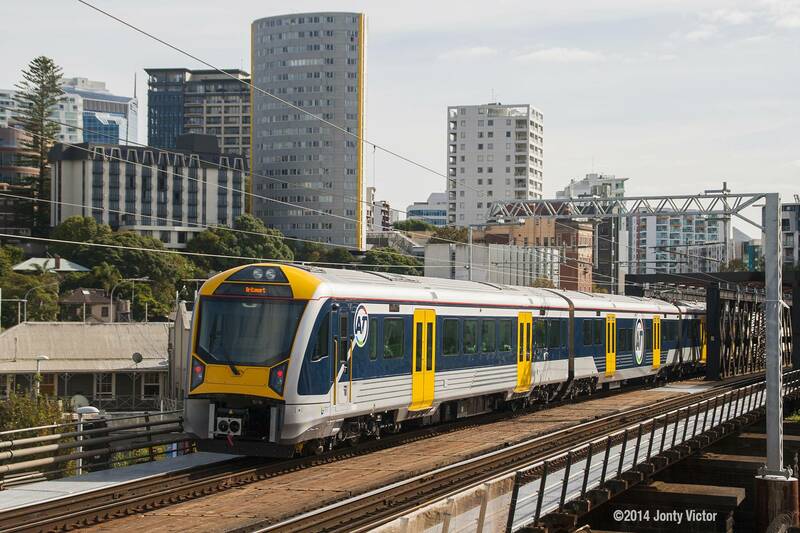 Jon – I’ve just had a read through your plan and I can’t see how an hourly train between Pukekohe and Huapai would have any real impact on overcrowding of existing trains, given it would only run hourly and would not travel to Britomart, by far the busiest station in Auckland. Also I would have thought Newmarket junction was already full (there are often delays there currently), given this train you describe will probably have relatively light loadings I doubt there would be much tolerance for it impacting on the punctuality of existing services. Patrick, putting personal attacks aside, you obviously missed some of the other points of this, it increases the number of carriages available on the network as ridership increases 20+% p.a. until new EMU’s are funded, ordered, manufactured and shipped to New Zealand in 2021 or 2022. It could also possibly allow a few more EMU’s to operate as double sets. With high frequency of trains passing Newmarket anyone wanting to transfer could easily do so. No need to remind you that you and other authors on transportblog are highly in favour of transfers at high frequency points and your praise of that style of system for buses and bus/rail connections. So the system is out of capacity and needs these extra carriages that don’t go where the demand is, but anyone wanting to go where the demand is can just transfer to a full service? Also you argue against transfers in your reasoning for why this service is needed so which is it? It’s also worth pointing out that AT have already said that in April they will move to make transfers easier for south/west services at Newmarket by opening both doors of trains. There is still a lot of ways to boost capacity on the existing trains including turning seats longitudinal, off peak fares and improving run times (which frees up more units to make more trains 6-cars in length). You also seem to ignore a few important points. To be anywhere close to useful such a service would need a decent enough frequency. Anything less than every 15 minutes at peak and it would be useless for all but the most hardy but to provide that level of service would cost a considerable amount of OPEX at a time when AT can’t even fund off peak frequencies properly on the existing network. At this stage running such a service would have to come at the expense of some existing services. Even if you found more money, the Newmarket junction is close to, if not at capacity so can’t cope with more services and in a few years the western line itself won’t be able to cope as it will be severely affected by the CRL works at Mt Eden. Have you got official data on what capacity is for Newmarket station and where it will be on March 12? I understand the stance you and Patrick have chosen to take, that’s fine. But at the moment the ratepayers of Huapai, Kumeu and beyond have a terrible bus service and no busway is funded or planned to be build for many, many years/decades. The railway line and station exist and yes, some capex needs to be invested but why do you worry? AT will throw $195 million of ratepayers money away if they do not use the SA/SD rolling stock (maybe they will get $5 million for them, as per the failed sale last year). Is that AT being responsible with our funds? With all the points you’ve suggested, will you be able to cope with 20+% demand over the next 4 or 5 years if new EMU’s are ordered in 2017? Would 4 additional sets of SA/SD’s help provide relief on the Western and Southern line for passengers wanting to travel to any points as far as Newmarket without a transfer? Huapai and Kumeu has changed a lot in a short space in time. No one from this blog has ever had the initiative to meet the Huapai-Kumeu Local Board, residents or businesses. I can organise an invitation for you if you are open minded. You’d need seven sets for an hourly service Jon, five in operation, one hot spare to swap out for breakdowns (of which we remember there are plenty with those trains), and one on rotation for routine servicing and maintenance. Thats seven sets of carriages and seven diesel freight locomotives to pull them with. At the same time you would need fifteen LEs and fifteen TMs more on the payroll. Have you actually paid any thought to what your scheme entails and what it would cost? Also I must ask, who do you think is ever going to catch the thing? A once per hour diesel dungger that only goes between the suburbs, sharing with six times an hour new electrics that go between the suburbs but also go downtown. If you take the minor fraction of users that only want to go from a suburban station to another suburban station, then divide that by one train out of seven an hour that can take them there, you are looking at a very, very small market indeed.Just how much ratepayers money are you going to burn subsidising each passenger? And which other PT services are you going to slash to fund it? There’s also the issue of bringing back unreliable (see reliability stats on next newest TB post) diesel trains and the knock-on effects of broken down diesels blocking the path of all the EMUs. Reliability risks tumbling back to the bad old days pre the EMU rollout. You really need to check out Kumeu and Huapai some time for house building and then revisit the term nostalgia. This is a high growth area with next to no public transport yet it has a rail link sitting idly by because of the electrification limitations. And it is but a matter of time before the gap between Swanson and Huapai starts to fill! Agreed. From what I’ve seen some comments appear to come from people who have not seen what is taking place in the area. It’s massive and the rail infrastructure and rolling stock is all there. Please, if you have a numerical argument, bring numbers. Even ‘a lot’ of detached houses (with big garages) out in the freshly ruined countryside do not, by any means, deliver any number of Transit users, especially on a service heading nowhere in particular. Furthermore, please describe the proximity of these new dwellings to the sadly severed stations along these rural shopping strips. Expensive to operate urban transport systems require high volumes of users, any responsible provider has to ask what catchment are we serving and at what cost. And are there cheaper, more direct, and more frequent alternatives available for this need (whatever it is)? It is very very hard to understand the determination and energy put in to promoting rail services to places and on patterns that just can’t work. And when I say work I mean be justified for the cost, and attract riders at volume, issues that simply cannot be waved away, no matter how much old rolling stock there is about. It’s a mismatch; ex-urban settlement patterns and urban transit. Although the new times are a move in the right direction we are only now catching up with diesel time tables and lets not forget the Onehunga train stopped at all stations and was still faster! I wanted to go by train to Gillies Rd. Train to Newmarket then catch a bus and walk up. The default setting on the journey planner is train to Newmarket then Uber or taxi from there. Why doesnt AT have faith in their perfectly good bus along Manukau Rd. It took awhile to ovrride this taxi default to find the bus number and times. Second observation. Train to Bruce Springsteen and back worked really well. Our gate was on the far side of the stadium. We walked out onto the road straight onto a train and home. Seamless. Train waiting filled up and gone. A train rider I know is getting annoyed at the pessimistic journey planner which results in leaving earlier than necessary and having to kill time at the destination. Suspicion is the timetables are being “sandbagged” which may make good-looking on time performance figures, but not sure if it’s producing the right result for passengers. Yes the sandbagging is frustrating, but you can’t argue with 18%+ sustained growth which 95%+ on-time performance must be contributing to. Hi Nick. Thanks for your post. Now I need some answers from you. – You have chosen to over look the fact this will add a lot of additional capacity for direct southern line services Pukekohe – Newmarket and on the Western Line to Newmarket. Why? – I realise some are ideologically opposed to using refurbished diesel hauled locomotives, but with a timetable which is pretty much the same as a diesel service the services won’t be slower than the EMU’s! What’s you issue with that? – All the points Matt L raised are highly unlikely to cover the 20+% growth per annum by the time new EMU’s are ordered and delivered in 2021/2022. What are your solutions for coping with that much growth (which we all celebrate as a positive thing)? -Do you, Patrick and Matt fully agree with the AT Board’s decision to waste a $195,000,000 investment in ground up refurbished rolling stock? – Once again, I can invite you, Patrick, Matt and any other transportblog regulars to come out to meet the Kumeu-Huapai Local Board to discuss this issue. I find face to face meetings so much more conductive than keyboard discussions. When suits? Erm I didn’t overlook it, I discussed that right above where I noted it would be one train an hour added to the six an hour that run on those lines at peak already. I just don’t think adding one suburb to suburb train per hour out of six that serve the suburbs and the city is any meaningful addition of capacity. Again just who do you expect to use it? My aversions to diesels aren’t ideological, they are practical. I don’t want old obsolete trains breaking down and blocking the line when I’m trying to get to work! They used to fail all the damned time, you realize we replaced them for a reason right? If you want an ‘ideological’ stance, mine is against low frequency crosstown suburbs only train routes. Why would we run such niche services that are designed to fail. Once an hour, and not serving the main destination? Who would catch it? I thought you were a transport planner? I catch trains daily and guess what? I see plenty of passengers alighting and boarding en-route. Usually a large amount of passengers alight at Newmarket. You highly praise transfer points with high frequency, this will offer that. The only part of the whole network with one train per hour would be Swanon-Waitakere-Huapai/Kumeu. The remainder will be additional services. I cannot understand why a transport planner could not understand that. Like I said, bring your expertise to a meeting with the Kumeu-Huapai Local Board. Silence has been deafening. Yes Jon, about 20% of passengers alighting and boarding en route… with the high frequency service and new trains. I know, great aren’t they? But you are taking about adding one train an hour, a train that *only* serves the suburban-only catchment, one out of seven trains an hour. So of your 20% that are going crosstown and can take any train, you be lucky to attract 1/7th. The only time it would make sense to take the hourly train is if it happened to be the next train that turned up. So at best you are proposing a specialized train service targeted at 2.8% of train users. In other words, you are planning it (or not planning, as the case may be) to be a structural failure with no chance of ever being effective or a good use of ratepayers money. Of course the main problem with profligate pet projects is they use the funds that would actually achieve something elsewhere. Unless you’re proposing a targeted rate to pay for it? Let’s discuss that with the residents. By the way we praise network connectivity, not forced transfers. There is a difference, and you don’t need to be a transport planner to see that. Patrick, I find you complete lack of understanding of the situation out west rather intriguing. As mentioned, it would be perfect for you, Matt and Nick to come for a meeting with the Huapai – Kumeu Local Board for discussion with your expertise on the matter. March is good, let me know. Yeah fine I’ll talk to them. I hope they have more to say that ‘we want lots of infrastructure and we want someone else to pay for it’, which is unfortunately what every board says. I’ll be interested to see their business case and implementation plan. Boards have a budget for this sort of thing, have they put their money where their mouth is? Perhaps they could do some market research and find out who would use this infrequent crosstown line, I’d love to see the data on that too. With that negative attitude I doubt you would be open minded to any board suggestion on transport for their area. Fair enough, but I’m not the one you need to convince, I don’t call any shots here. You need to convince the people the fund, subsidise and operate transport. They don’t care about positive attitudes, they care about huge holes in their budget that bleed out funds and cause the transport system to get worse. And quite frankly if you can’t convince the likes of me, a train enthusiast and public transport advocate, how will you go with people who don’t care about PT at all? Jon you need to understand that money spent in the past on something is no argument for spending more on that same thing. You claim that historical money is being ‘wasted’ all over again by not spending more money now, but that just isn’t true, it’s gone either way. The question can only be is there value in spending today’s and tomorrow’s budgets on this. And has to be evaluated against all other PT opex demands in the city. In other words; what is opportunity cost of funding this or any other service, what don’t we do elsewhere? Be careful of becoming yet another politician with a pet project, that is one of the things that has got us into this mess, sure they’ve largely been motorway ones, but the same principle holds with rail or any others. Which of course doesn’t mean that you shouldn’t champion ideas, but it is still the quality of the idea that matters, on real boring practical levels, not the passion of the champion. I am extremely ambitious for passenger rail to succeed in Auckland, and it is for that very reason that I don’t want to see budget and energy lost on projects that can’t possibly add to the current success. Yeah that makes way more sense. I don’t understand why they aren’t suggesting that. I completely agree, in my opinion running a service all the way from Huapai to Pukekohe dilutes the intention of the PTUA’s advocacy RE Huapai rail. They want Huapai to have a rail service- DMUs that connect to Henderson or Swanson could run at least half hourly and wouldn’t require anywhere near the level of OPEX this link to Pukekohe does. I’m moving to Huapai next year and am currently a Northern Busway advocate so I am all for connecting Huapai/Kumeu and all the growth there to a RTN, however it has to be done right so that it lasts. The area is currently very poorly served by PT but I imagine that either DMUs or a frequent bus service to Westgate would satisfy demand until the bus-way is built. I just wish they’d have an hourly service to Swanson from 12.30am to 2.30am on Saturdays. In off peak times when we have more train sets free, we must be able to manage Onehunga on 20min frequencies to improve things a bit from it’s always 30 mins. This is relevant to the Southern’s New Network. It’s showing as possible post CRL, but perhaps can’t be done before that even if terminating at Britomart (via Parnell)? Which raises the point that Parnell would get a drop in service frequency from what will be come Monday 10mins at peak each direction from the Southern line. Looking forward to stopping at Parnell tomorrow (Sunday) by the way when it “opens” finally!